What do you rinse? Turns out I rinse all the wrong foods. Essentially, if you're going to cook it, you don't need to rinse it - any bacteria will be killed by the heat. If you're eating it raw, like veggies and lettuces, you should rinse. Other things, like rinsing starch off potatoes or rice, is a matter of personal preference, not health or hygiene. Rice: hardly ever, but like potatoes, below, the final, cooked product (for white basmati) is a little nicer when I've rinsed it first. Lentils: never, and I have yet to find a rock in my masoor dal. Lettuce: sometimes, depends on the variety. Potatoes: hardly ever, but I prefer how my oven fries taste when rinsed after cutting. But then they need to be dried well, and this is a a time sink, so I rarely do it. Poultry: always. I buy organic, skinless, boneless chicken breasts and they feel slimy or slightly sticky out of the bag. Fish: always, for approximately the same reason as chicken, above. Beef: don't cook it often, but never rinse it. It doesn't feel like it needs rinsing the way chicken and fish do. The foods I do rinse (fish, chicken breasts, even my Thanksgiving turkey) are foods that for which rinsing is not recommended on account of cross-contamination and the thing about killing them with heat. Why is it I have an easier time eating a dead salmon than the dead bacteria coating her lovely body? The thing I'm most lazy about is lettuce. My feeling generally is, if it's got dirt on it, I'll wash it. I forget about bacteria on veggies because it doesn't gross me out the way bacteria on fish and poultry do. But it's bacteria all the same. It's hard to believe, in the age of antibacterial wipes and hand sanitizers, that a little water could rinse dangerous bacteria off our salad greens. Breakfast quinoa? That might not be a bad idea, though I'd try Heidi's or Martha's recipe first. I've only ever made quinoa as a savory side dish. Following Kristine's recommendation, I often add sliced almonds just before serving. But If I cooked it in nonfat milk, and added toasted almonds, and a handful of those plump sour cherries I like so much I bet it'd be a great breakfast. I am a big fan of hot cereal though I don't eat a wide variety of them. 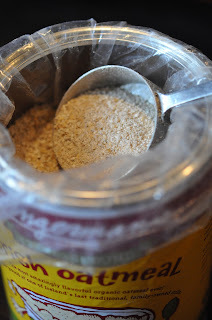 I love Cream of Wheat, but oatmeal is my go-to on a cold morning. Or when I'm at Zingerman's in Ann Arbor. They make really good oatmeal there. I bought some of their stoneground oats last fall when I was sure I wouldn't make it through another Chicago winter without them. It's an imported Irish product, Macroom. I'd kind of like to do a taste test against a quicker-cooking version I sampled from Trader Joe's this summer. The Macroom version, in addition to arriving in a nearly impenetrable can (I had to look online for instructions on how to open it) takes forever to cook. This is the thing about breakfast: I'm lazy about it because I don't really care enough. I'm rarely that hungry in the morning, and by the time I am hungry I no longer have time to spend cooking. My kids favorite school-morning breakfasts remain French Toast (I make it on a sprouted wheat bread, like Alvarado Street), corn bread, and pancakes. My favorite cold breakfast is light granola, which I eat most mornings. It's got the right balance of honey, nuts and seeds and is so nourishing. I make a batch of it every few weeks. But I'm needing a change. I sense an Egg Mess in the offing! Or an Egg Soft Taco with Frank's Red Hot and Parsley. Substituting Meat for Carbs? Death First! This came across my desk the other day: Nutrition: Risky Additions to a Low-Carb Diet. I've been hopeful that a study would come out that discouraged people from indulging in sausage and bacon while curbing carbs. And now it has. Monkey bread isn't that difficult an undertaking. It just requires a lot of rising time. The best way to do it is to make the dough and form the bread the night before you plan to serve it (assuming, since it's a breakfasty sort of a thing, that you'll be serving it before noon the next day). Then, you can cover it loosely with plastic wrap and set it in the fridge for its final rise. When you wake up, remove it from the fridge while you preheat your oven. Then bake as directed. And do note baking times. Monkey bread gets baked in a tube - and only a tube. If you use an light gray aluminum pan it will bake for about an hour. If you use a darker, heavier tube pan, it will only need to bake for about 40 minutes. 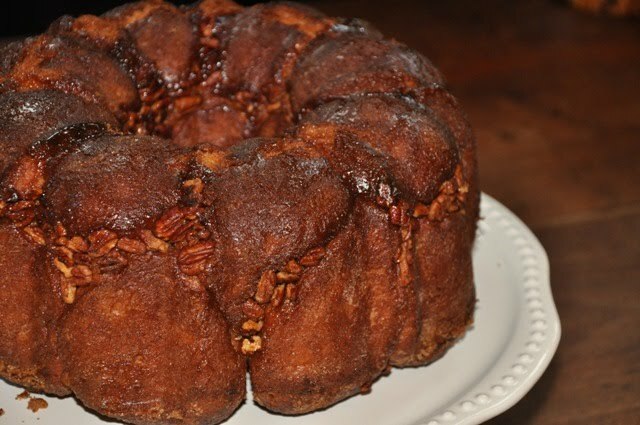 This recipe is adapted from The Fannie Farmer Baking Book. If you only have room on your shelves for one baking cookbook, this should be it. Anyway, the Pinch version has lots less sugar. Combine yeast, milk, water and sugar in a mixing bowl and let dissolve for about five minutes. Add salt, butter and eggs and whisk well. Add 2 1/2 cups flour and mix well. Add another 2 1/2 cups flour and beat on mixer with hook attachment for about 2-3 minutes. Turn out onto a floured counted and knead for a couple of minutes. Then return to the mixing bowl and let rest for 10 minutes. Using dough hook again, mix dough for about 5 minutes (alternately, turn back onto the counter and knead for a long, long time - like 8-10 minutes), adding more flour as necessary. Then place in a clean, greased bowl, cover and allow to rise until double in size. Punch down and let rest another 10 minutes. Combine the sugars and cinnamon in a medium bowl and pour the warm, melted butter to a sheet pan. Grease a 10-inch tube pan quite well. Tear off golf-ball sized pieces of dough and roll them into balls. You should form about 30 balls. As you form them, transfer them to the sheet pan and roll them around in the melted butter. Once all the dough is formed, roll the balls one at a time in the sugar and transfer to the greased tube pan. Once you have the bottom of the pan covered, sprinkle about a third of pecans on top. Keep layering the pan with sugared dough and pecans until you've used everything up. Sprinkle the top with some or all the remaining sugar and cover loosely with foil or plastic wrap. At this point you can refrigerate the dough overnite. Or, set it aside to rise to the top of the pan. Bake in a preheated oven at 350 for 40-60 minutes, depending on the pan you've used (see above). Let cool for about ten minutes before inverting it onto a serving plate. I like to invert it again, so that the top is the side that was on top as it baked. Allow it to cool for at least 15 minutes before allowing any monkeys to tear into it. Seriously, I am so sick of the term. When I entered the profession fifteen years ago, not many people used it and the ones who did were credentialed, either as professionals or passionate cooks. Now everyone who eats thrice daily is a foodie. I don't call myself a foodie for a few reasons. One is heirloom tomatoes, which I'm embarrassed to admit I just don't care for. Another is condiments including, but not limited to, Heinz ketchup and Hellman's/Best Food's mayonnaise. The last is Philadelphia cream cheese. In each case, the product equals the brand. Oh, I'll add Heinz malt vinegar here, too, since I can't possibly shake anything else onto my oven fries. Perhaps someone with a very sophisticated palate would not insist upon zero variation in the taste and texture of their tomatoes, condiments or cream cheese. Maybe only a real foodie can appreciate Zingerman's fresh cream cheese or Aunt Fern's homemade ketchup. Maybe only real foodies are delighted by non-conforming tomatoes. But I don't. So I cannot be a foodie. 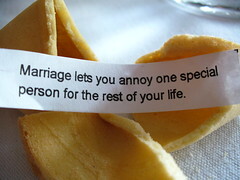 Fortune cookies are usually a disappointment - humorless, meaningless fortunes encased in a yucky cookie. We still play along, even though I'm not one to put any stock in fortune-telling. When our family is dining at the kind of establishment that issues cookies along with the bill (fine-dining, according to the younger set) we crack them open, take turns reading the fortunes aloud and congratulate the recipient of the best fortune. Then, the children jockey for our cookies and eat every last crumb. You are the master of every situation. Sometimes a little whisper is all it takes. I tucked that quote away and soon thereafter quit my job and began that pastry apprenticeship, thus setting into motion the chain of events that would lead me to becoming the master of every situation. What's your best fortune, ever?